There are two common types of macular degeneration, “dry” and “wet”, with dry being the most common. In dry macular degeneration the loss of vision is usually gradual and is caused by thinning of the tissues of the macula related to aging. There is a great deal of debate concerning the role of nutrition and nutritional supplements in slowing the progression of this form of macular degeneration. A great deal of attention centers on the role of lutein and anti-oxidants in slowing the progression of the dry form of macular degeneration. Wet macular degeneration is less common but may lead to a more rapid loss of vision. 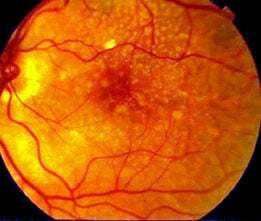 This form of macular degeneration is caused by the formation of abnormal blood vessels in the retina, which leaks fluid or blood. Dry macular degeneration can lead to wet macular degeneration rather quickly. Laser treatment is sometimes effective if an individual is diagnosed with “wet’ macular degeneration and receives treatment quickly. That is why the amsler grid given to patients is extremely important. All changes in the grid need to be reported immediately to an eye care specialist. Often these cases are referred to ophthalmologists who are retinal specialists for treatment. New diagnostic testing makes the decision to pursue treatment of wet macular degeneration more effective in many cases. Those who find treatment of little benefit are referred to low vision clinics. While improvement of vision is not an option, there are devices on the market to improve the quality of life with low vision. Ocular Coherence Tomography (OCT) is a state-of-the-art diagnostic technology that provides direct, real-time, cross sectional images of the retina. This technology is much like ultrasound technology, except it uses light waves rather than ultra-sound waves. The OCT scans an infrared red light across the retina, which generates a cross sectional image of the tissues in great detail. This test is quick, requires no dilation, and enables the doctor to view and accurately measure structural changes in the retina, as if it were under a microscope. The high-resolution images produced by OCT allow for early diagnosis and treatment of a wide variety of conditions, including glaucoma, macular edema, macular hole, and age-related macular degeneration.